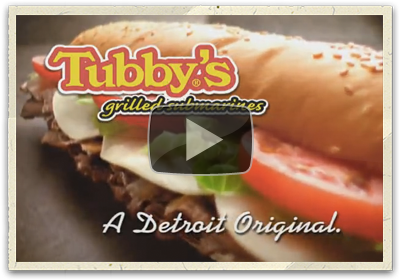 Tubby’s started selling submarine sandwiches in Detroit in the late Sixties. Today, Tubby’s is larger than Blimpie, larger than Quizno’s… larger than any other sub chain (with the sole exception of Subway) in the markets they compete in. In fact, their Michigan-based presence is similar to most national QSRs. Unfortunately, their marketing budget isn’t, and they’ve lost customers to larger competitors outspending them a hundred times over. Tubby’s had “underexposed” differentiating benefits: an excellent (and expanding) fresh-grilled product line and a three-decade Detroit legacy. So Shirley/Hutchinson rebranded them as “A Detroit Original”… using TV, radio and strategic POP components. There’s more. For a better Motown fit, Shirley/Hutchinson found R&B legend Dobie Gray (“Drift Away”) and produced original music for all broadcast media. The result: sales are up. More stores are opening. With Shirley/Hutchinson, what really matters is not the size of the budget. It’s the size of the idea.